Providing you the best range of bottle sealing machines, bottle washing machine and rotary bottle washing machine with effective & timely delivery. Bottle Washing Machines made available by us comprise automatic combo Two-in-One Bottle Washing Machine that are designed and constructed so as to meet CGMP standards. Being special machines, these are perfectly suited for combo two-in-one operations involving water and air cleaning for glass bottles and air jet & vacuum cleaning for pet/HDPE/ bottles and containers. Further, these machines also come equipped with safety devices so as to ensure in these smooth as well as silent operations while at the same time also having high rated outputs. 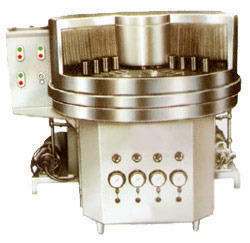 Special machine for combo operation (two-in-one operation). Water and air cleaning for glass bottles as well as air jet and vacuum cleaning for the pet/hdpe/ bottles & containers. Machine equipped with safety devices to ensure smooth and silent operation with high rated output. 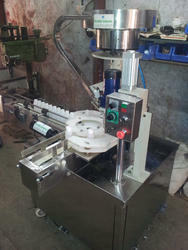 Machine can accommodate with different size of bottles with the help of change parts. Owing to perfection and quality oriented approach, we have carved niche in the industry by offering an enormous grade array of Rotary Bottle Washing Machine. The offered machine is designed and manufactured using best grade components and advanced technology by our deft professionals. To make sure of quality, this machine is stringently tested on different parameters. 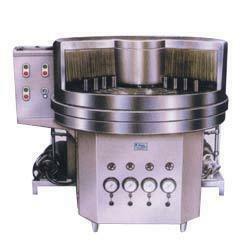 Clients can avail this machine from us in different specifications, as per their needs. Looking for Water Bottle Making Machine ?